For a mars tunnel use we would be less in need of power or support systems as they could be connected to a supply rail for what power is required to move the vehicle from place to place. Clear to see through plastic would be lighter than glass or seramics. Robert Dyck has talked about what types can take the environment of mars in some of the greenhouse topics but the windows to see from need to not only be low mass but be intergrated into what ever structure is used for the remaining parts of the vehicles body shell. I think we can make use of some part of an inflateable designed materials simular to what is proposed but not as thick hopefully for mars as these are lighter than a simular capability in aluminum. Nice find. That stuff could also be useful for repairing composite aircraft. Still looking at how to do other plastics for making the vehicle from. Its a motor no its a generator and depending on what why its wired its can be both. pg 5 is also being referred to as a pancake motor as well in that it is possible to make it work as such. Something to remember is we can build multiples on the same shaft to boost the output power from the same rotation. If all you're trying to do is move 10kg a single kilometer, then the easiest way to do that will be a small rover with a CO2 rotary engine. That negates the need for any fantastic power-to-weight requirements. We already have air powered motorcycles that can take riders 10's of kilometers over rough terrain on a single charge of a SCBA tank. By way of comparison, this little vehicle would be rather small and light. There's obviously terrain to navigate around on the ground, but that's still a heck of a lot easier than managing vertical takeoffs and landings and fantastically more efficient in terms of compressed CO2 expended per kilometer travelled in most cases. If that's not enough of a challenge, then a lighter than CO2 vehicle with a CO2 powered motor could deliver the payload without navigating around terrain. The dynamic pressure of the wind is so low that significant power would not be required for a balloon to cover that kind of distance. The atmosphere of Mars is so thin that any type of winged aircraft would have to be more harrier than normal airplane. Still doable? Sure, but at what cost? The entire idea is to deliver a small payload (emergency consumables / medical supplies / small replacement parts, perhaps) to someone who needs it. Maybe you should try all three (ground rover, balloon, harrier) just to determine what the energy requirements for each happen to be and general utility / use cases. I'm guessing that the balloon would be lowest, followed by a ground rover, and the harrier would likely consume the most energy. There would be other trade-offs, though. The balloon might only work at low to moderate speed and above ground, obviously. The rover could enter caves or habitat modules, unlike the other two, but would have difficulty in rough terrain. The harrier would probably be the fastest, out of necessity. It might rocket up into the atmosphere, follow a ballistic trajectory to the target, drop the payload by parachute or soft land it with a last second hover maneuver to reduce vertical descent speeds, and then rocket back to base and touch down there. Anyway, just some different ideas to play with. Like I said, there are significant trade-offs associated with all 3 methods. This will apply to the means to make it work.. So we now have a gas powered generator from the expansion of mars atmosphere and a secondary in solar and pedal power eneration for a single person transport. So a Tuk-Tuk for Mars. I think I would give it 4 wheels for better stability. Many nice images from all over the world. It was the template for the meter maid vehicle of the last century as well. Its used in other crowded places as low cost uber transportation it would seem. Alternative designs for a micro home and for Mars I would agree should be 4 wheeled. Here is a solar powered version which when created as a hybrid vehicle for mars is fantastic. It is hard to tell how much solar is on the machine but hopefully we can find the information or come up with a good guestimate. Found one image that has 8 panels but unsure of what power capability they would have but its on the website one would hope. 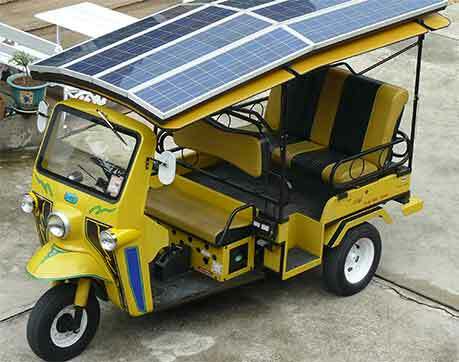 Something that could make a base vehicle to modify would be one of the Vantage mini electric vehicles which come in 3 formats to which use the stock base line and optional parts to make it a verisitle vehicle for pedal, solar battery hybrid design to start with for a single passenger to make use of. The maker does manufacture this vehicle in gas engine as well as the electric but we would only use the electric as a starting point for the purpose of design.